(Nov 2, 2012) David M. Oates said:I remember spending my pocket money on Led Zepplin, Black Sabbath, Tangerine Dream and Kraftwerk albums at Scene and Heard in Barnsley. It was so dimly lit you sometimes had to take a cover to the door to read it... 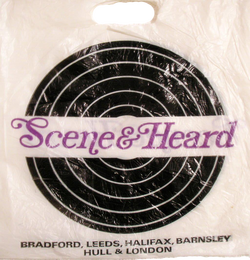 I can't remember when Scene&Heard closed but at that time Barnsley also had Casa Disco and Neals in the Arcade as well as chainstores selling vinyl. Neals were great for ordering obscure or new releases. My Wife remembers buying 'Another Music in a Different Kitchen' at Scene&Heard. By the way, we have never parted with any albums, they all get played & lots have the receipts inside the sleeve. I mourne the passing of independent record shops. Name John Kruse Comment: Neal's Music in the Arcade in Barnsley was mainly a stereo/ hi-fi shop. It had record racks at the back near the counter but their range was pretty general, including classical and easy listening, and they didn't have any specialist rock/ pop knowledge. Given that there were two other independent shops- Scene and Heard and Casa Disco- along with Smiths and Boots (this is the 70s) I tended to go elsewhere. All the others had much bigger ranges and the two indie shops always had the more obscure or new stuff. (Sept 13, 2016).